Life after Rough: what next for the UK gas market? Last week the Competition and Markets Authority (“CMA”) announced that it has provisionally accepted an application from Centrica for the company to be released from the historic undertakings relating to the Rough gas storage facility. The application came on the back of Centrica’s decision in June to close the facility on the basis that the required maintenance to the site was no longer economic. Rough is a partially depleted gas field located beneath the North Sea, 18 miles of the Humberside coast. It sits in a layer of sandstone, capped by a layer of impermeable rock, which has been accessed by 30 different wells, and represented around 70% of the UK’s gas storage capacity and its only long-term storage capability. What were the Rough undertakings? The undertakings date back to 1997 and the de-merger of British Gas into separate upstream and downstream businesses, with Centrica being the downstream entity and BG the upstream gas entity and new owner of Rough. Prior to the de-merger, Rough was regulated under British Gas’ transportation licence and subject to price controls. Following the de-merger, the price controls were lifted in favour of a set of informal undertakings given by BG, under which BG agreed to offer the full capacity of Rough to potential users on non-discriminatory terms under a standard storage services contract (“SSC”), sell all capacity by auction with at least half the capacity being offered for at lest 5 years; facilitate the development of a secondary gas storage market; and maintain full separation between the storage operation and the rest of BG. US energy company, Dynergy, bought the asset from BG in 2001 gave similar undertakings with the exception that Dynergy was allowed to sell capacity by means other than auctions. However the following year the company ran into financial difficulties, leading to the acquisition of Rough by Centrica for £316 million. That year Rough had a turnover of £87 million. In 2003 the then Competition Commission was asked to report in this acquisition, and in particular, whether Centrica would be likely to withhold sources of flexible gas in order to force up wholesale gas prices. The Commission felt that Centrica did have the ability to do this, and that such a strategy could be profitable if most of the resulting increase in wholesale prices were passed on to domestic customers. However, the Commission noted that any potential gain would be modest in relation to the costs involved, and that Centrica would face significant reputational risk if it were found to be manipulating the market which would probably lead to significant loss of domestic customers, and adverse regulatory consequences. facilitate the efficient operation of the secondary market in Rough capacity. Centrica agreed to the undertakings, which remained in broadly the same form aside from some changes to the volumes available to Centrica for its own use. 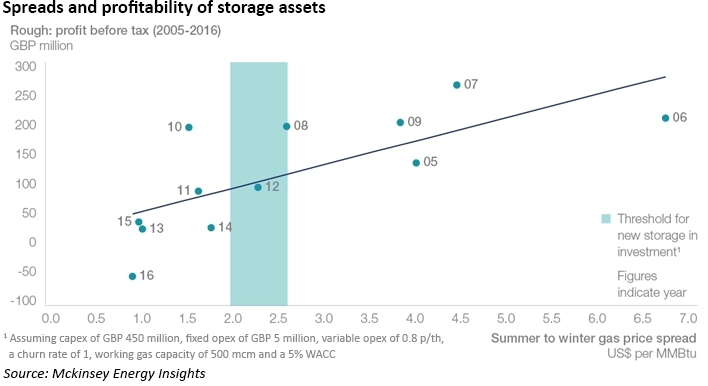 The economic context for seasonal storage has deteriorated in recent years, with significant narrowing of winter-summer spreads which drive the fees customers would be willing to pay to access the facility. This has undermined the investment case for maintenance programmes, and over time the condition of the facility has deteriorated. The same economic drivers that made investment in Rough unattractive are also undermining other storage investments. According to McKinsey, spreads are likely to remain in the US$1.2-1.2 / mmBtu range for the next two storage cycles. Rough has played a critical role in ensuring security of the UK’s gas supply since the country became a net importer of gas in 2004 – without it, the UK has lost 3.3 bcm of working capacity (~70% of total UK storage capacity) and ~41 mcm/day of deliverability (25% of UK storage deliverability). Peak gas supply capacity utilisation could rise from ~50% to over 80%. The closure of Rough will eliminate the UK’s only source of seasonal or long-range storage. The gap will be filled by other flexible sources of supply including LNG or interconnectors with mainland Europe – effectively, the UK will access Continental European storage facilities, of which there are many, through use of the interconnectors. Expected tightening in the LNG markets in the mid-2020s could be problematic, and the rules governing the operation of the interconnectors with Europe may be adversely changed as a result of Brexit. “Whilst for now there is ample LNG, this will not always be the case. LNG is a notoriously boom and bust market. The current “oversupply” comes off the back of a prolonged period of scarcity and record spot prices. Speed of response to meet demand spikes – impacted by cargo location, regas access terms and unforeseen challenges (e.g. vessels delayed, technical hitches) – is not the same as for the alternatives. Last year was the first year without Rough, since the facility was temporarily unavailable. 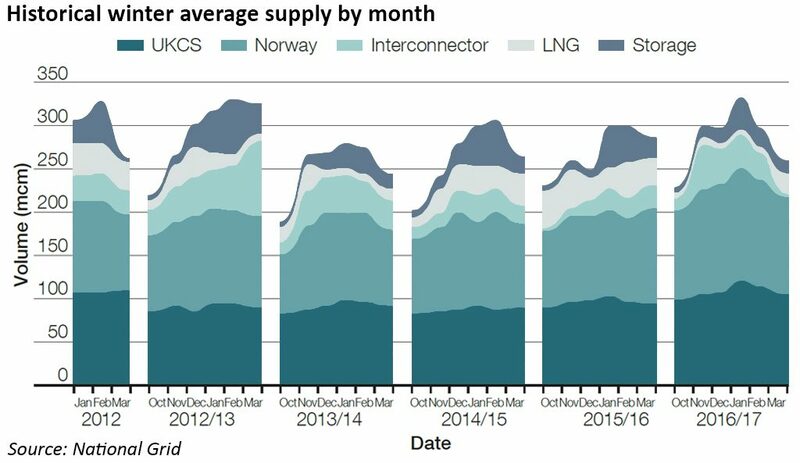 Flows from the UKCS and Norway were broadly stable, with day-to-day variations being taken up by more dynamic sources of supply. Cycling from medium-range storage in particular was higher. NBP vs TTF spread: price spreads are reflecting the changing flow patterns – the NBP premium to TTF widened last winter and was rarely much below IUK variable cost or around 2 p/th. Sharper NBP discounts to TTF have been seen across the last two summers. Price volatility: the loss of UK deliverability is translating into rising UK spot volatility in 2016-17, reflecting the UK’s greater dependence on import supply chains (NCS, IUK/BBL and LNG). There is still around 4 bcm of gas left in Rough, of which around a quarter will be withdrawn this winter. Aside from this, there is 1.4 bcm of storage space and 121 mcm/day of deliverability available across the UK’s medium-range storage facilities, many of which are capable of a rapid transition between injection and withdrawal, along with strong deliverability. This means these sites can re-cycle or replenish very quickly, which was in evidence last winter when Rough was unavailable. National Grid expects the UK gas market to be well supplied this winter from a number of sources including Rough. Longer term UK security of supply will more strongly affected by global gas market dynamics: Asian demand, political issues in the Middle East particularly in relation to Qatar, Australian domestic gas prices and US LNG exports. The full impact of the closure of the UK’s only long-term gas storage facility may not be apparent for some years.